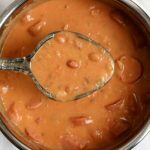 Instant Pot/Slow Cooker Creamy 15 Bean Soup–the classic 15 bean soup recipe with a creamy twist! 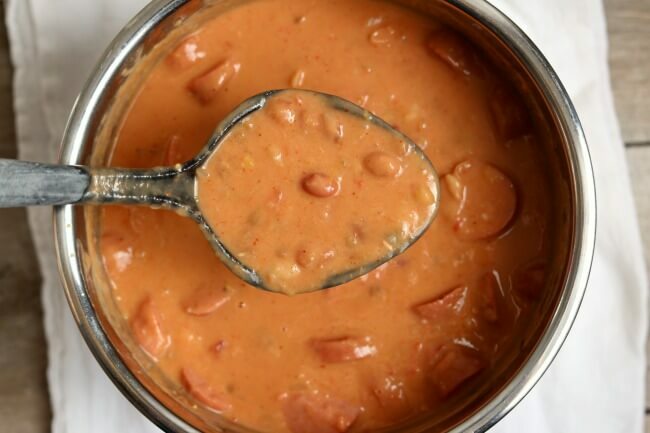 You’re going to love this thick and creamy bean soup with smoked sausage or ham. Make it fast in your pressure cooker or let it simmer all day in your slow cooker. Big thanks to Hurst’s Beans for sponsoring this post. If you’re serving ham for Easter dinner I hope you have some leftovers! And if you do I hope you make this soup. It is so good. It might be my favorite ham and bean soup yet. If you don’t have ham leftovers don’t fret, you can use sliced smoked sausage as well. I like to soak my dried beans overnight before I use them. Soaking dried beans helps them become more easily digestible. In addition soaking them in a salty solution seems to make the skins softer. The problem is usually I don’t remember to soak beans. That’s why I’m a fan of using the quick soak method. I made this video to demonstrate how to quick soak the beans in the Instant Pot. One thing that I really like about this Instant Pot/Slow Cooker Creamy 15 Bean Soup is that it makes a huge batch! By the time the soup was done it was almost to the top of my Instant Pot. We were able to feed our family of 4 plus another family of 5! This soup freezes well and makes good leftovers for dinner or lunch the next day. What Pressure/Slow Cooker Did You Use? 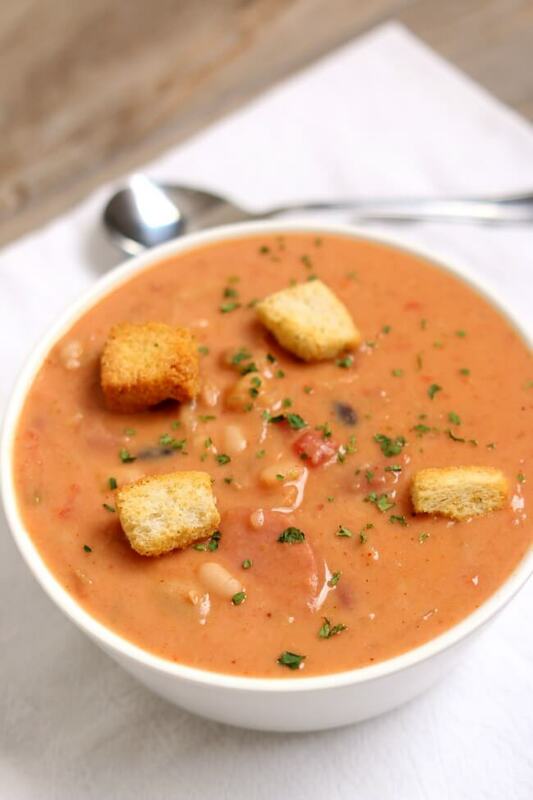 The classic 15 bean soup recipe with a creamy twist! 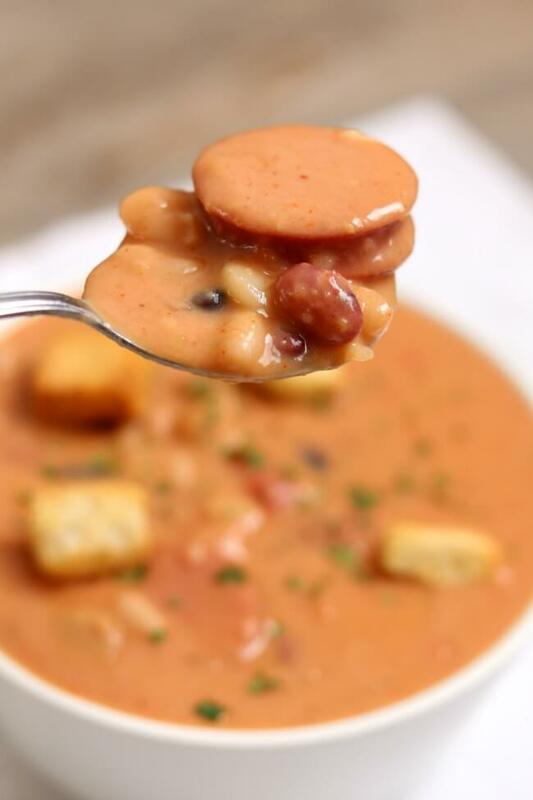 You’re going to love this thick and creamy bean soup with smoked sausage or ham. Make it fast in your pressure cooker or let it simmer all day in your slow cooker. Soak the beans: you can soak the beans overnight or you can do the quick soak method. To soak overnight dump beans in a large bowl, save the seasoning packet for later. Sprinkle 1 Tbsp of salt over beans. Fill the bowl with plenty of water to cover the beans. Soak for at least 8 hours or up to 24 hours. Rinse the beans thoroughly in a colander. For the quick soak method, see my note below or watch my video above. Pressure/Slow Cook: Add the soaked beans to the Instant Pot. Add in half of the seasoning packet onion, 1 tsp salt, ham and 6 cups of water. Cover the pot and secure the lid. Make sure valve is on sealing. Set the manual/pressure cook button to 18 minutes on high pressure. When timer is up you can perform a quick release. If foam comes out move valve back to sealing and try again in 20 seconds. 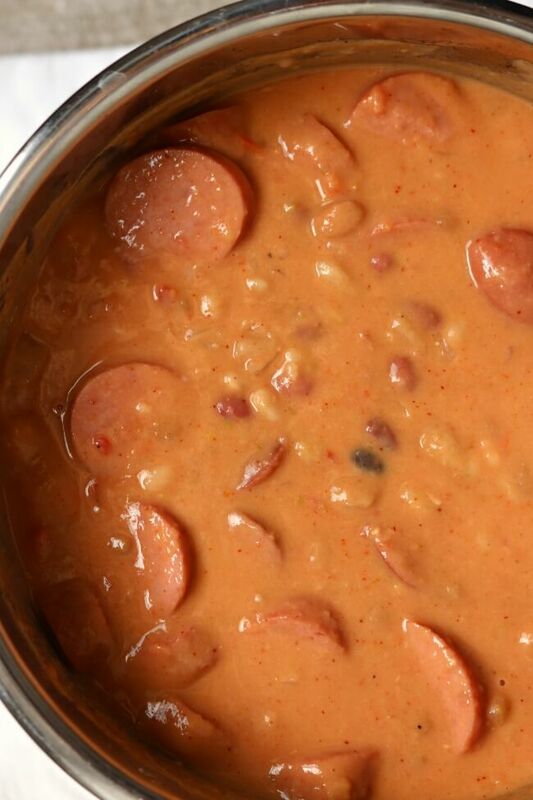 Slow Cook: If you’re using the slow cooker add soaked beans to the crock, add in half of seasoning packet, onion, 1 tsp salt, ham and 6 cups of water. Cover and cook on low for 8 hours. Finish the soup: Remove the lid. Add in the rest of the seasoning packet, tomatoes, tomato sauce, chili powder, lemon juice, garlic and evaporated milk. Turn Instant Pot to saute (or turn slow cooker to HIGH). In a small bowl whisk together the melted butter and the flour together until creamy. Once it is creamy add in a little bit of the soup. Whisk. Add the mixture to the pot and stir. Let the flour mixture thicken the soup for about 5-10 minutes in the Instant Pot and about 20 minutes in the slow cooker. Stir often. Season to taste: finish the soup by salt and peppering to taste. Add in additional seasonings if desired. Serve this soup with cornbread, rolls or croutons. 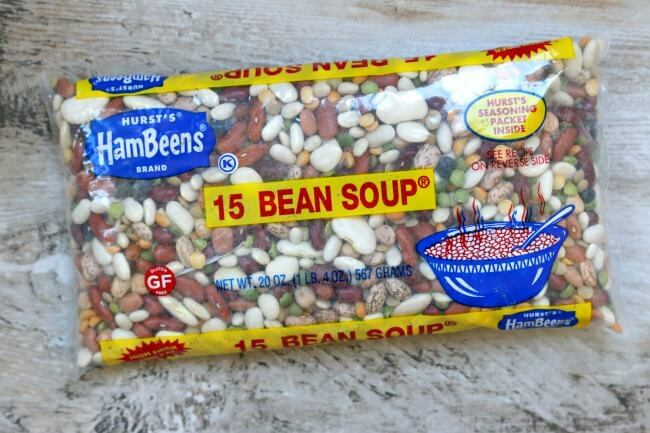 This soup freezes well. Instant Pot QUICK SOAK METHOD: First just pour the beans into a colander and rinse them off. Sometimes dried beans have a little dirt and debris in them. Once they have been rinsed you can add the beans to the Instant Pot. Next you’ll cover the beans with water. For every one cup of beans you’ll want about 3-4 cups of water. I used 8 cups of water for the entire package of dried beans. Now you’ll bring the pot to a boil by using the the “sauté” function on your Instant Pot. Once the water comes to a boil you will cover the pot with the lid and set the valve to “sealing.” Then you’ll set the manual pressure cooker button to 2 minutes. When the timer beeps you can open the valve very slowly. If foam begins to exit the valve stop releasing the pressure and wait for 30 seconds before you try again. Once the lid is removed go ahead and drain and rinse the beans in a colander under cool running water. Now you can proceed with the recipe that requires pre-soaked beans. This recipe can be gluten free: Substitute the flour with a GF flour blend or corn starch. 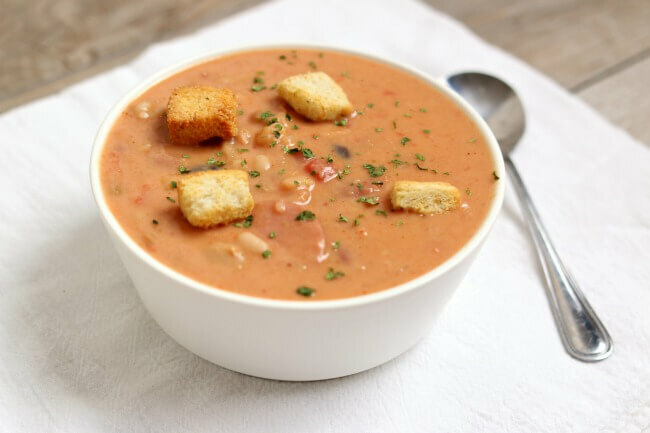 Like this recipe for Instant Pot/Slow Cooker Creamy 15 Bean Soup? Get all my new recipes delivered to your email inbox by signing up below. This was a great soup. I went with the smoked sausage but I like a little more spice. So need to up the temp a bit. PS the recipe makes a whole Vat of soup. yes it does! Leftovers for days! It was an unseasonably chilly day in North Central Texas this past Saturday, so I made this and used both ham and smoked sausage. It’s fabulous and nice that it makes a lot so I had plenty to freeze for another day. Thanks again for the great recipes – keep them coming! So glad you liked it! It’s nice to have a chilly day just so you can make soup!